The Monastery of Saint Marina is located opposite Apoikia of Andros, where comes the famous water Sariza, and dates from 1325 A.D.
Saint Marina had revealed herself to an ascetic elder and indicated to him to find her icon which was hidden in a slit of a rock. Emperor Emmanuel II Komnenos in turn financed the erection of this Holy Monastery. During the 16th century, the Monastery burned down three times by pirates, losing its old glamour, and in 1743 there were only five monks. Then Saint Marina brought to the Monastery the Hieromonk Sophronios, who sold his property in the Peloponnese and fully refurbished the Monastery and converted it to a female convent in 1746. 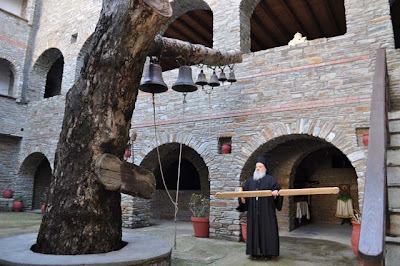 This brought many women from Andros to dedicate their lives as monastics, and eventually 100 nuns lived at the Monastery. Following the Greek War of Revolution, Orthodoxy in Greece suffered under the Protestant Bavarocratia of Otto. Under the Bavarians 417 monasteries in Greece were forced to close in 1833. Saint Marina Monastery was among these, and closed in 1833. The holy icon of Saint Marina was purchased by the Emberikou family to preserve it. They placed it in a church dedicated to the Panagia, and there it remained safe for 146 years. Meanwhile, the Monastery was fully destroyed during this period. 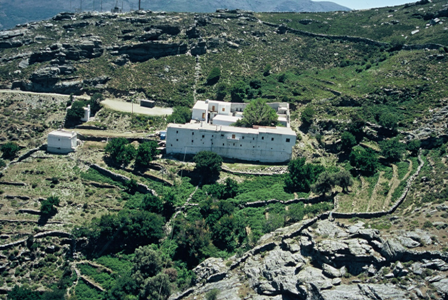 One and a half century passed, and in 1975, the Metropolitan of Syros, Tinos, and Andros Dorotheos, passing through the ruins of the Monastery, asked with pain of heart that his Deacon Kyprianos rebuild the Monastery. Kyprianos denied the request because he had other plans, but that night he received a visit from Saint Marina, who appeared in his dreams and said: "I am Marina, and I with my two sisters Paraskevi and Katherine live in the Monastery. Because of the decree of Otto we were cast out and live a little above the Monastery and we will come again to live here. Me, you will see every day. Together we will struggle and rebuild the Monastery. Receive then the command of your Master. You listening Kyprianos!" So Fr. Kyprianos worked hard for five years and rebuilt the Monastery. 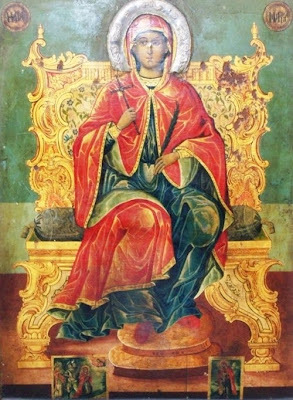 In 1976 the wonderworking icon of Saint Marina returned to the Monastery. In the same Monastery is a wonderworking icon of the Panagia which miraculously brings back to life dead flowers during the first fifteen days of August. A similar miracle takes place at the Monastery of St. Nicholas, also in Andros. The Monastery has now become famous, and Saint Marina has performed many miracles, revealing her presence and love.